IProx controllers - in their nano, compact, lite and standard versions (simply IProx)- are electronic devices, permanently connected to the internet, which collect information from the environment in which they are installed and transmit it to a web application (IProx Cloud, IProx Factory or IProx Irrigation) where the consolidated data can be accessed. Moreover, all the devices in the project can be controlled. The control commands are received through the same channel used to send the information, allowing remote control – and, if necessary automatic – of machines, processes and installations. IProx controllers perform the data capture using sensors directly connected to their analogue and digital inputs or by means of a communications protocol and an Ethernet port connection or serial port of a machine or automaton. In order to control the machine or process there are analogue and digital outputs, or commands can be transmitted by means of the same Ethernet or serial port used to collect the operating information. Internet communications can be undertaken by means of an Ethernet connection to a LAN with internet access or through GPRS/3G communications using a SIM included in the equipment. Immediate activation of digital and analogue outputs by comparison events (>, = , <) of the inputs with configurable values or with other inputs, both physical and virtual. These controllers are the perfect “supervisors” of the machine or process 24 hours a day, 7 days a week. And with the advantage that their “modus operandi” can be easily configured and updated remotely by a person familiar with the machine or process in question. Monitoring and automation of: hydroelectric plants, biomass plants, solar thermal power plants, water treatment plants, pumping plants, compressors, packing plants, aggregate mills, portable asphalt agglomerate pumping plants. Each physical variable to be measured has various options of sensors capable of capturing the variable with the precision and speed required in each case. The most popular sensors include temperature, pressure, mass, 3D volume occupied on a base, energy, weather, limit switches, position, fluid level and distance. To complement the collection of numerical data, fixed IP or PTZ cameras may be added. In those locations where there is no electricity supply, the low consumption of these controllers means that they (and the sensors) can be charged using a solar power kit. When the remotely managed machine is portable (for example generators, asphalt agglomerate plants, water treatment plants), a GPS receiver is very useful for visualising the location of the machine in the IProx Cloud web application. Sensors: weather, water pressure, water level for pools, wells and deposits. A wireless opening and closing solar power controller for 4 PRX-VALVE solenoid valves. This controller has a range of 1000 metres to the nearest aerial, or another PRX-VALVE device. A PRX-SOIL device for measuring soil moisture up to 4 depths. 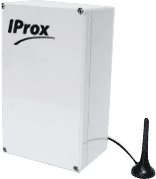 The transmission of the moisture levels is performed by radio to the IProx controller located in the pumping plant or via GPRS/3G directly to the IProx Irrigation web application. By means of a specific communications plug-in, IProx Irrigation is compatible with pumping programmers and controllers and valves from other manufacturers. Ask us. Network analysers to measure electricity consumption. Radio communications masts with PRX-VALVE and PRX-SOIL devices. Video cameras for real time remote viewing (and recordings) of cultivation areas and pumping stations. The only requirements for the installation point are that is has either an electric or solar power supply (although we also have models which are run by batteries) and GPRS/3G/4G coverage or Ethernet access to a local network with internet access. In order to visualise the data and control of the machines or processes with the IProx Cloud or IProx Factory web applications, it is sufficient to use any device with internet access and an updated web browser. We can supply personalised controllers with electric interface plates, pre-installed cables, connectors, special software versions, sensor kits, etc., in order to best adapt them to the machine for which they will be used, therefore reducing the total supply, installation and start-up cost. P: Can just one controller be used to monitor and control various machines? Yes, if the wiring between them and the controller is economically viable taking into account the low cost of the controllers. P: Can a controller collect data from a database or ERP software and incorporate the data read into the installation’s events and control as if they had been read by sensors or calculated as virtual entries? Yes, in order to do this we provide a communications plug-in that implements the access protocol of the database or ERP available in each case. P: Can a controller send information to a database or ERP software? For this type of data transmission, our clients can use an API REST, available in the IProx Cloud and IProx Factory services, at no extra cost. P: Can they be installed outdoors? Yes, with the exception of the compact model. Obviously, if they are protected they will maintain their appearance and will last longer. P: What is the delivery time of the controllers? We normally have all models in stock. For large orders, please consult us. P: What do the controllers cost? Complete this form to receive your quote by email.